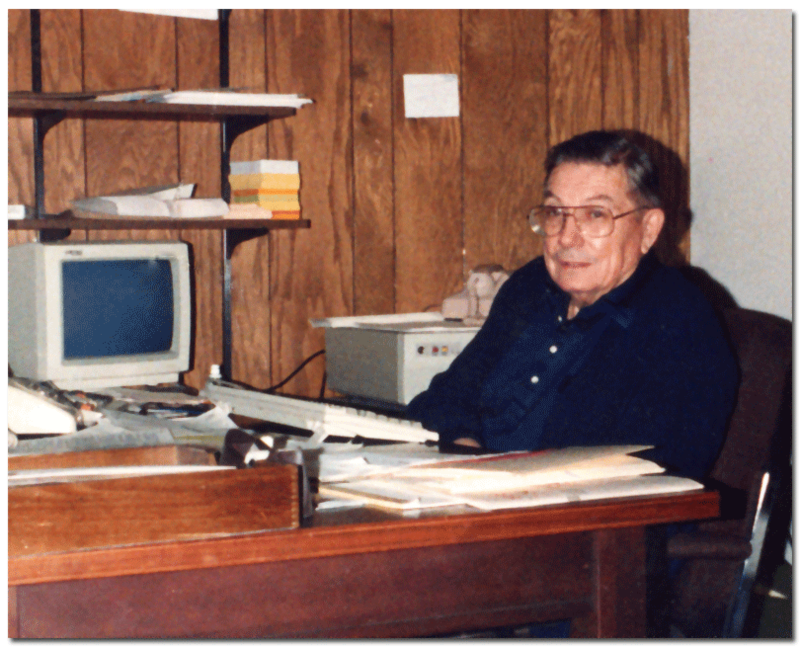 John Weinard at the reception desk of his office on Clinton Avenue, Minneapolis, some time in the late 1980’s. John Weinard was born in August of 1916 and grew up with his family on Nicollet Island. John’s father made a living selling and installing wallpaper. John often recalled to me how his dad would go into the caves under the Island to fix the plumbing in their family house. John was impressed with how his father knew just where to go in the caves to find the right valves to shut off the water. When John was twelve years old he was carried off by the current of the Mississippi river and nearly drowned. Though traumatic, it did not stop him from competitive swimming in college or from his favorite summer pastime: fishing. John often recalled to me how his time in the CCC’s (Civilian Conservation Corp) were some of the best years of his life. He loved the hard work, discipline and energy. He learned to love nature and the camaraderie of the young men his own age. He also liked the way he could save the money that paid for his education at the U of M.
During WWII and even for a bit afterwards John, worked as a civilian in a U.S. airfield in Greenland. He married Margaret and they raised four children: John Jr., Susan, Bruce and Sandy. They lived in Philadelphia for a time, then Chicago,and finally resettled in the Minneapolis area. John built a successful career in bookkeeping and financial matters working for Grayco and culminating as, more or less, the CFO of Horton Manufacturing Co.
As a side business John began doing tax returns professionally. By taking a deep and genuine concern for each of his clients, John built a solidly loyal following of people from all walks of life. Stock brokers, policemen, factory workers, teachers, nurses, truck drivers, barbers, janitors, construction workers, pensioners, day laborers, you name it…even a lion trainer came to rely on John to do his or her return. As the south Minneapolis neighborhood diversified, and as we moved out to Calhoun Square, and then to Rosedale John prepared returns for people from all over the globe. Egyptians, Oromos, Laotians, Guatemalans, Indians, Mexicans and Tibetans asked for John or asked how he’s doing.